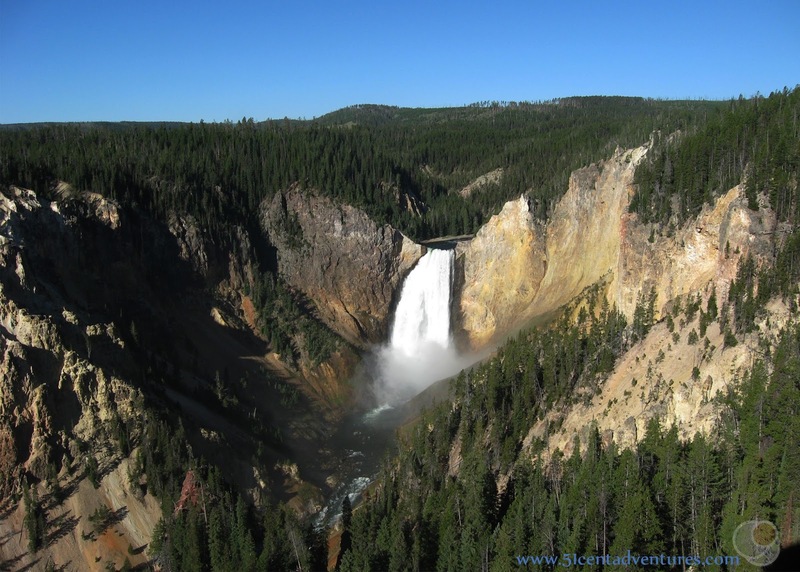 The North Rim of the Grand Canyon of the Yellowstone is lined with great vantage points where anyone of any ability can view the Lower Falls waterfall. This iconic 308 foot high waterfall is visible from Lookout Point and Grand Point. A 3/4 of a mile round trip hike takes you down to the Brink of the Lower Falls. The Red Rock trail takes you to a lower point in the canyon with a great view point. Location: The beginning of North Rim Drive is located a little more than a mile south of Canyon Village. North Rim Drive is a one way road that is 2 miles long. The road leads right back to Canyon Village. 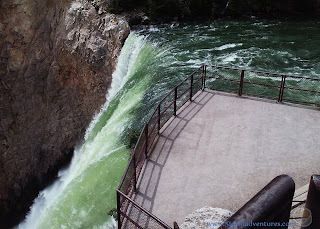 Hiking Distance and Time: Brink of the Lower Falls is 3/4 of a mile long. But it takes you down (and then back up many switchbacks.) Plan for an hour and a half to hike down and back up the switchbacks. Red Rock Trail is .3 of a mile. Plan for about 45 minutes for that hike. All the other points on the trail are simple lookouts that won't take long to view. 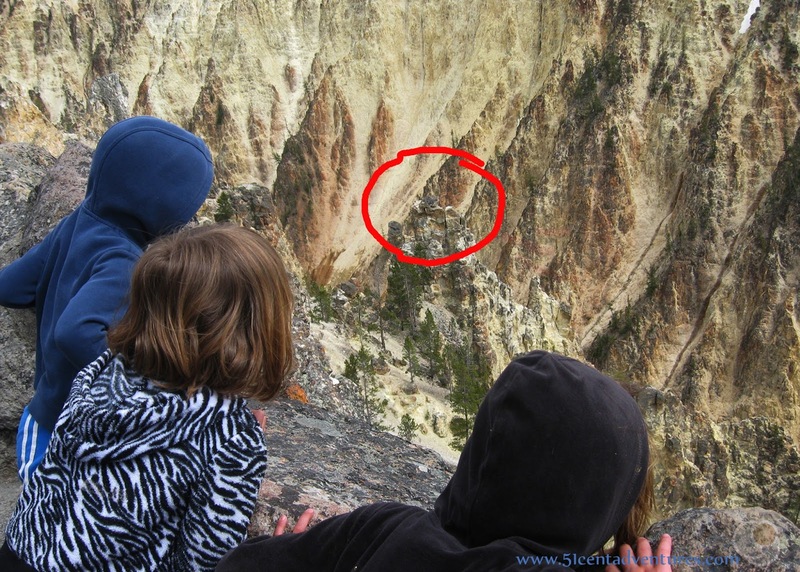 Open Season: North Rim Drive is open Mid-May though October. Lookout Point and Grand Point are accessible as soon as the road is open. But the trails to other lookouts could stay closed until Mid-June due to snow. 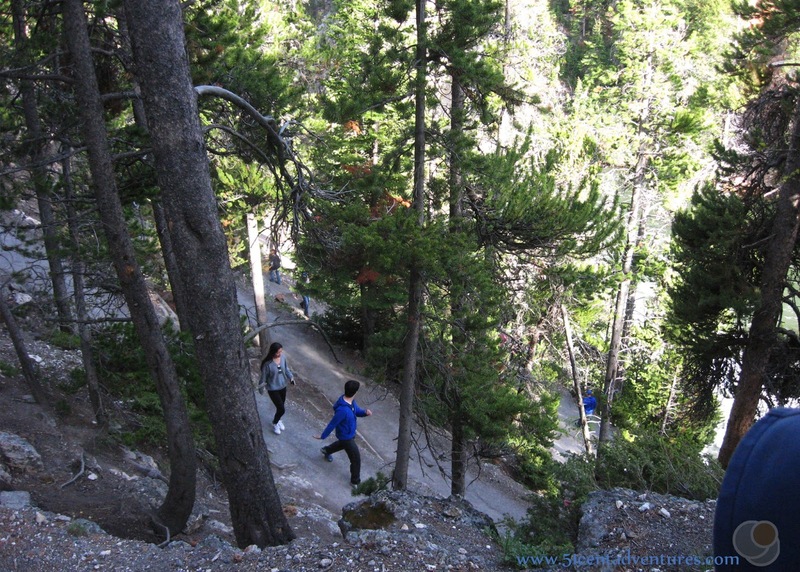 Closure Information: Normally the North Rim Trail extends all the way to Upper Falls. However that section of the trail has been closed. I do not know when it will be open again, but I assume it might be closed until 2019 when the trail construction around Upper Falls is complete. Inspiration Point is also closed. It will reopen in July 2018. In the summer of 2017 I received a job with Xanterra Parks and Resorts in Yellowstone National Park. I moved there with my husband and our four young children. We lived in a 25 foot RV and spent all our free time exploring the park. 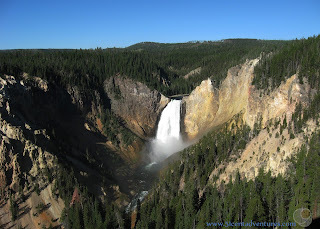 This is the twelfth of many posts that I will write about specific features within Yellowstone National Park. At first these aren't going to be in any particular order, but in a few months I'll start grouping them into lists. 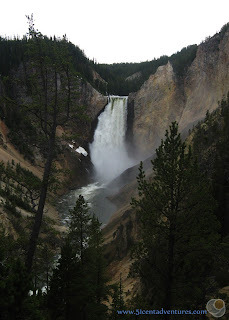 This one would probably fit into a list such as Must See Places in Yellowstone. 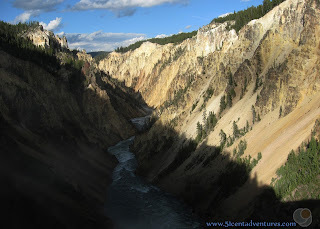 If there is one part of Yellowstone that I know better than any other, it's the Canyon Area. 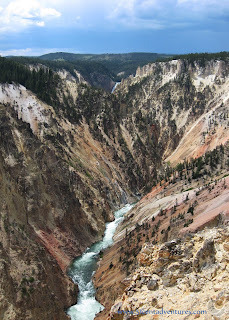 On each of my four trips to Yellowstone I made sure to stop in the Canyon Area at least once. 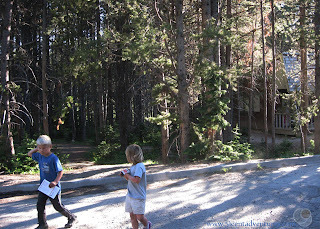 During our summer in Yellowstone my family lived in the Canyon Village employee campground. We hiked on trails in the Canyon Area at least once a week. We got to know the area very well, and I'm excited share the places we discovered with you. The Canyon Area can be divided into four main sections. There's the village part with the hotels, campground, dining facilities, visitor center, gift shops and gas station. There is the North Rim of the Canyon, the South Rim of the Canyon. And finally there is the Upper Falls Area. 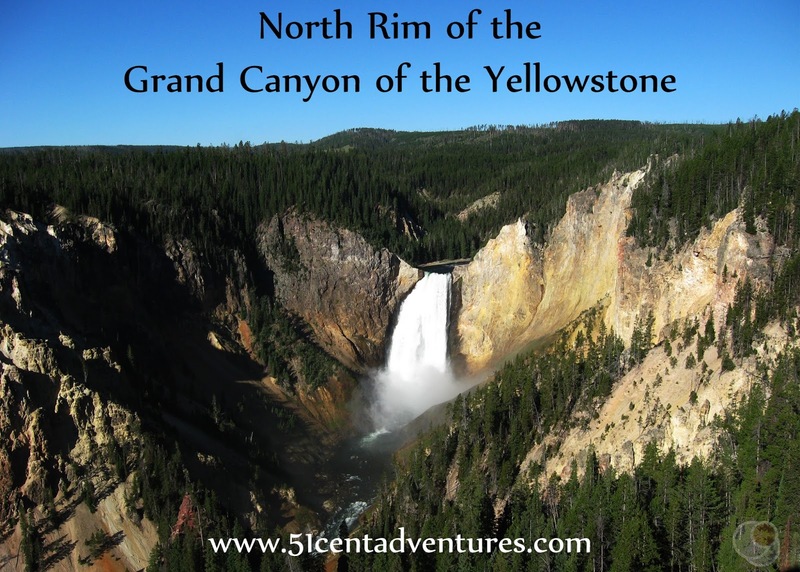 Today we are going to talk about the North Rim Area. The North Rim Drive is located a little more than a mile south of Canyon Village. The road is two miles long. It is a one way road that runs from the Grand Loop Road and then curves around to Canyon Village. This is one of the most popular places in the park. Which means it's going to be terribly overcrowded during the hours between 10:00 and 5:00. If you want to enjoy your visit to the North Rim of the Canyon you should come here either early in the morning or in the evening. 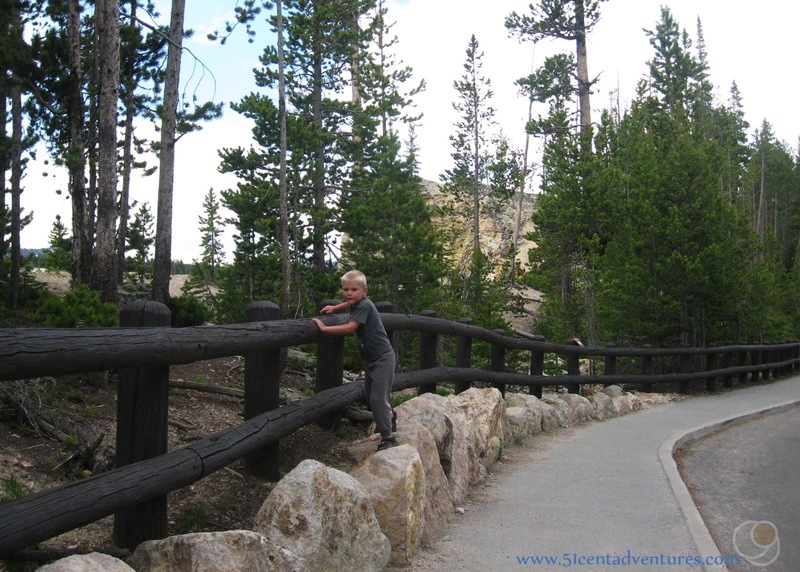 We often drove by the entrance to the North Rim Drive and saw parked cars lining the road. And that was just for the entrance. People still had to walk a third of a mile to even reach the first parking lot. But in the evening it was a whole different story. My family often visited the north rim around 6:00 at night. The area was much less crowded, and we could always find a parking spot. Okay let's talk about all the different places you can stop along the North Rim Drive. The first parking area that you come to is the one that you want to stop at if you are planning to hike down to the Brink of the Lower Falls. This trail will take you down to the edge of the waterfall. This hike is 3/4 of a mile round trip. It doesn't sound like much, but remember, the return half will be up-hill. This was the first hike we took the kids on when we moved to Yellowstone. Come to think of it, this was the first major hike we'd ever taken the kids on. It went about as well as you'd expect a hike with 4 small children to go. There were tears, there were threats, there were bribes, and we didn't even make it to the Brink because the lower half of the trail was closed due to snow. It was an inauspicious beginning to our summer in Yellowstone. But as the summer went on our kids became better hikers. 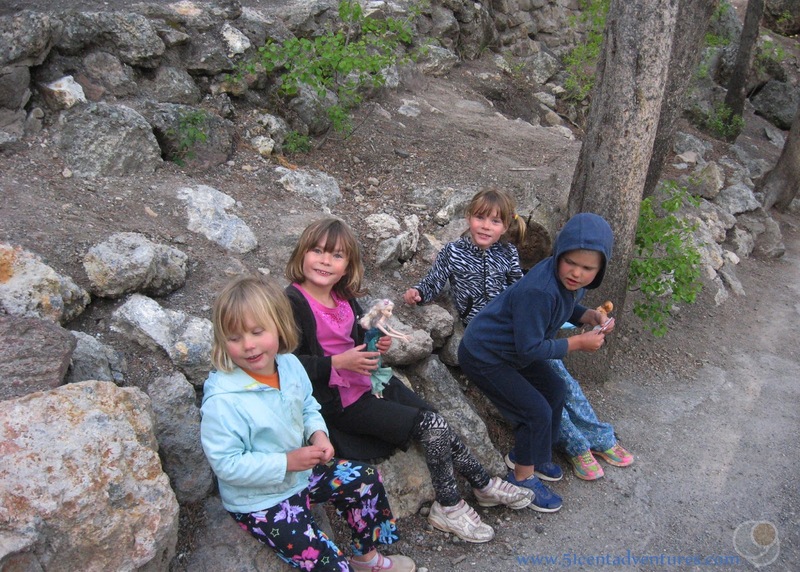 They got to the point where they could easily hike down to the waterfall and back up and still have energy. This is such a popular area that there are actually two viewing platforms at the edge of the waterfall. One is right next to the water. The other is about 30 feet above and to the side of that one. Both have great views. Standing on the edge of a waterfall is always a rush. There is something mesmerizing about watching the curtains of water drop to the river below. The view of the Grand Canyon of the Yellowstone from this vantage point is unrivaled. Return to the North Rim Drive via the same route. One nice thing about this trail head is that it has bathrooms with running water. If you only have time for one stop on the North Rim Drive it should be at Lookout Point. You'll be able to see the waterfall from a vantage point that is closer than the famous one at Artist Point. No matter how many times I came to Lookout Point I was always impressed by the waterfall. Lookout Point is also a great place to look at an Osprey Nest. The nest is perched at the top of a rock spire along the canyon wall. If you have time, plan to take a hike on the .3 of a mile Red Rock Trail that heads off from Lookout Point. This trail starts with several switchbacks. Then it becomes a board walk trail with wide, wooden stairs. The view of the waterfall from Red Rock Trail is from almost the same level as the waterfall. When the full trail is open, the North Rim Trail is three miles long and extends from Inspiration Point all the way to the Chittenden Bridge over the Yellowstone River where it becomes the South Rim Trail. Currently the the trail is closed between Grand Point and Inspiration Point as well as between the Upper and Lower Falls parking areas. The trail to Inspiration Point is scheduled to reopen in July of 2018. I don't know when the trail to Upper Falls will open. Because the trail connects all the view points on the North Rim of the Canyon, it's possible to park at one viewpoint and walk to the others. We often parked at Lookout Point and walked to Grand Point or vice versa. Unlike the South Rim Trail, the North Rim Trail is paved in some sections and has guard rails along most of the trail. This is the trail I preferred to walk on with my children. Grand Point is the next lookout down the road from Lookout Point. It's one of the highest lookouts in the canyon so it offers a bird's eye perspective of the whole canyon. A few yards away from Grand Point on the left hand side of the road is the mythical P-Loop Trail. This trail connects Canyon Village to the North Rim of the Canyon. But it's not as direct as you would hope. The trail starts/ends in the middle of the lodging area of Canyon Village. It doesn't lead directly to/from the Visitor Center area of the village. This is a good little trail if you are staying in the cabins, lodges, or possibly the campground in Canyon Village, but for anybody else you are better off taking your car. When I worked at Canyon Village I often spent my lunch breaks at the picnic tables near the General Store. 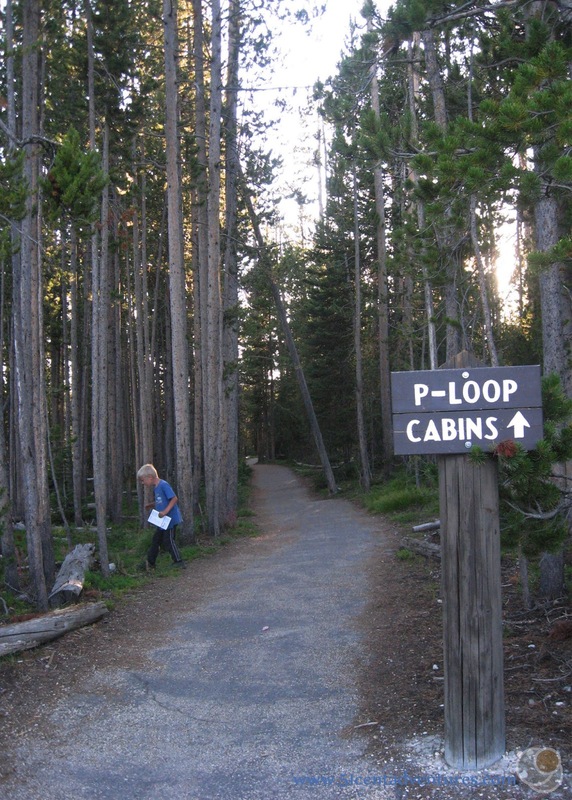 I can't tell you how many times people came up to me asking me how to find the P-Loop Trail. Just in case you really need to know, the trail head can be found next to Cabin 58. But good luck finding cabin 58 from the Visitor Center area. It involves quite a bit of wandering through the back road parts of the village. If you really want directions to the P-Loop Trail ask at the Canyon Visitor Center before you set out trying to find the trail head. If you do happen to find the trail, this is what most of it looks like. It really is a beautiful trail and is an enjoyable walk, but if you're looking for a short cut to/from the canyon you are going to be disappointed. Okay, back to the Canyon Rim. After Grant Point the North Rim Drive starts heading back to Canyon Village. A spur road heads to Inspiration Point which is .8 of a mile away. The area was closed for reconstruction during the summer of 2017 so I never went there with my family. However I did go there in 2010. This area has some pretty cool overlooks that are accessible via stairs. 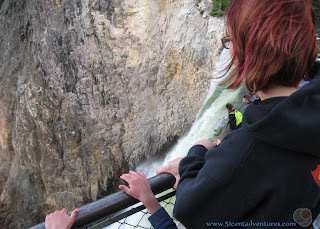 It's a great place to view the canyon, but it's not a good place for views of Lower Falls. I learned this the hard way during my 2010 visit. My husband and I were taking my sister and her husband on a quick road trip through Yellowstone. We arrived in the Canyon area after 10:00 and so the parking areas were filling up quickly. We stopped to hike to the Brink of the Lower Falls. 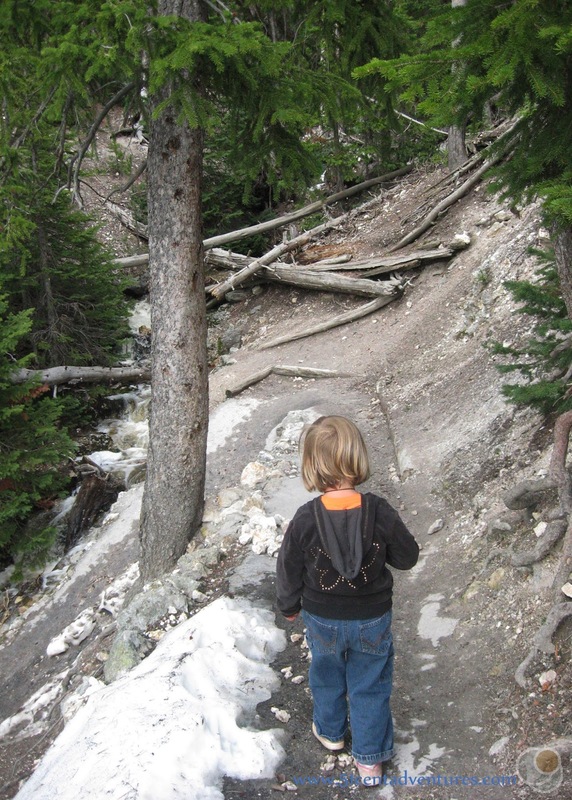 (I stayed behind because I was 6 months pregnant with the twins and was not interested in trying to hike back up the trail.) Then we kept driving down the North Rim Road. Parking was pretty bad at Lookout and Grand Points so we decided to skip them and go to Inspiration Point. 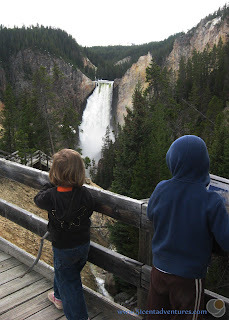 I was pretty sad when I realized that we'd missed the beautiful view of Lower Falls. You can just barely see the waterfall in the top third of this picture. 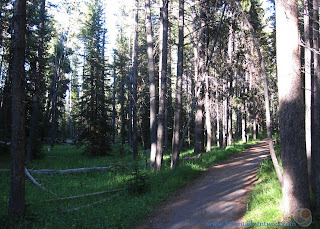 After you are done with Inspiration Point you head back to North Rim Road and then follow that back to Canyon Village. The road takes you right back to the village. 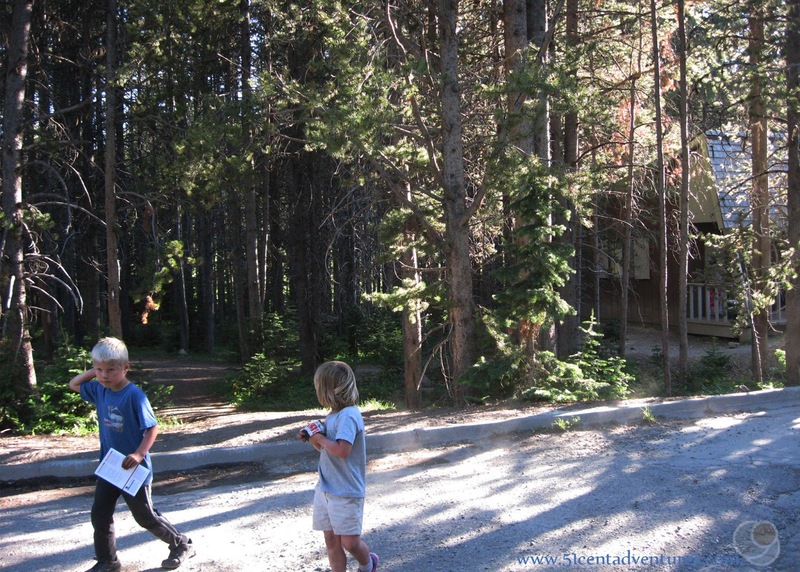 You'll pass the lodges and the campground before you reach the area with the stores and visitor center. Recommendation: Everyone should visit the North Rim of the Grand Canyon of the Yellowstone. At the very least you should stop at Lookout Point. If you have more time and stamina plan to hike to the Brink of the Lower Falls and/or Red Rock Point. Directions: North Rim Drive is located about 1 mile south of Canyon Village. Other than that P-Loop trail that indirectly leads to the North Rim, there is no trail that leads to the North Rim from Canyon Village. So you will need to drive there. Drive south from Canyon Village on the Grand Loop Road. A sign will indicate the road that leads to North Rim Drive. Every lookout will be on the right hand side of the road, but parking spaces will be on both sides of the road. Places Nearby: You may think that since you've seen the waterfall from the North Rim that you don't need to stop on the South Rim. But the South Rim has other great views. Seeing the waterfall from Artist Point is always a thrill. And climbing stairs on the Uncle Tom's Trail is a unique was to view the waterfall. So be sure to plan to drive and stop on that road as well.